In 2007, Chip Colwell was hired as senior curator of anthropology at the Denver Museum of Nature & Science to do a job he describes as “a paradox”: to protect and interpret twenty thousand Native American objects the museum had collected for the public trust, and at the same time to negotiate with hundreds of Native American nations over the return of objects and human remains that tribes maintained should never have been entrusted to the public in the first place. The 1990 Native American Graves Protection and Repatriation Act (NAGPRA) requires United States museums that receive any form of federal funding to publish inventories of the Native American objects and human remains in their collections. Furthermore, the act mandates that materials be returned to tribes that can prove cultural affiliation with such objects. The controversies surrounding NAGPRA, and the complex negotiations it continues to generate, are the subject of Colwell’s book. Shuttling between the specific repatriation claims at his own museum and the larger history of collecting and repatriation in the United States, Colwell outlines the thorny colonial histories that led to museums stockpiling Native American bodies and cultural heritage, and the difficult (but surprisingly positive) new relationships that NAGPRA has instigated, all in a manner that the public will understand. Colwell divides his book into four parts—Resistance, Regret, Reluctance, and Respect—to chart the changing attitudes of museums toward Native American heritage. In part one, “Resistance: War Gods,” Colwell chronicles the efforts of the Zuni of New Mexico to repatriate their Ahayu:dah (often translated in English as “War Gods”) from museums in the 1970s, before a legal framework for repatriation had been established in the United States. Ahayu:dah are sacred beings, twin gods who, as long as they are placated, serve as protectors for Zuni Pueblo and for the world at large. Their wooden embodiments are carved—born, as the Zuni say—each winter solstice in the hands of appropriate clan members, who later place the Ahayu:dah in mountain shrines to the east and west of Zuni Pueblo. As Colwell outlines, these remote shrines became targets in the early twentieth century for anthropologists and collectors, who blatantly stole Ahayu:dah when Zuni people refused to sell them. By the 1970s, one of these Ahayu:dah was in the Denver Art Museum; six more were nearby in the Denver Museum of Nature & Science. In 1977, the Zuni approached the Denver Art Museum for the return of the Ahayu:dah. Due to a lack of repatriation legislation at the time, as well as their own cultural protocols, the Zuni appealed to the museum to voluntarily return the sacred Ahayu:dah on humanitarian and moral grounds. Initially, the museum administration resisted, saying that “the object has in reality entered the public realm of world art” and that the museum “could not deprive the world public of further access to it” (37). Other museums defended the Denver Art Museum, stating that the return of the Ahayu:dah would be a “devastating precedent” that could “kill the museum” by draining it of its collections (37–38). But the Zuni persisted, and public opinion soon turned in their favor, with increasingly more people pressuring museum officials to honor Native American beliefs about their heritage. In March 1979, more than a decade before the passage of NAGPRA, the Denver Art Museum returned the Ahayu:dah to the Zuni. Colwell establishes that this was not the first precedent for repatriation in the United States, and he notes a few nineteenth-century examples. However, with other Ahayu:dah subsequently returned to the Zuni from the Andy Warhol Foundation and the Brooklyn Museum, the case ignited a national debate about repatriation. In part two, “Regret: A Scalp from Sand Creek,” Colwell shifts focus from sacred objects to the even-more sensitive category of human remains. This chapter details the work of Arapaho and Cheyenne communities to repatriate skulls and scalps that the United States military had taken from their ancestors at the infamous 1864 Sand Creek Massacre in southeastern Colorado. Colwell also charts the rise of federal legislation in the twentieth century that led to the creation of NAGPRA. In 1986, a delegation of Northern Cheyenne traveled from Montana to the Smithsonian Institution in Washington, DC, where they were horrified to realize that the museum vaults held the remains of 18,500 Native Americans: “the largest Indian cemetery in the country” (75). They addressed their complaints to Montana senator John Melcher, who drafted the first federal legislation aimed at the repatriation of Native American heritage from museums in the United States: the Native American Museum Claims Commission Act. Melcher’s bill was never enacted, due in part to protests from the Smithsonian Institution and the Society for American Archeology, but it added more fodder to the national debate about who should control Native American remains. In 1989, after several more attempts to draft a repatriation bill were thwarted, Suzan Shown Harjo (Cheyenne/Muskogee), president of the National Congress of the American Indian, was invited to Santa Fe to negotiate a new version of the bill with various stakeholders, including Secretary of the Smithsonian Robert McCormick Adams, an archeologist who had earlier opposed repatriation. Just before their meeting, Harjo learned that Adams’s museum held six skulls “collected” from the Sand Creek Massacre—skulls that belonged to her own Cheyenne ancestors. As Colwell explains, Harjo confronted Adams with the weight of this personal story, and Adams conceded to the compromises that Harjo and other Native American leaders requested. The resulting bill, the National Museum of the American Indian Act of 1989, established repatriation guidelines for the Smithsonian Institution and became the first federal repatriation legislation in the nation. It was followed the next year by NAGPRA, which covered all federally funded museums and agencies in the United States. Colwell charts the slow compliance of museums with NAGPRA in the years following its passage in part three, “Reluctance: Killer Whale Flotilla Robe.” He describes how the Alaskan Tlingit quickly established one of the most active repatriation programs in the United States. Their numerous repatriation requests initially confirmed the fears of American museum professionals, who worried that NAGPRA would decimate their collections (176). Colwell outlines the specific difficulties that the Denver Museum of Nature & Science faced in giving up a Naaxein robe (also known as a Chilkat robe) called the Kéet Xaa Naaxein, or Killer Whale Flotilla Robe. The robe is considered the at.óow, an “owned or purchased thing,” of the Naanyaay.ayí clan. As a collectively owned object, it is recognized under NAGPRA as an “object of cultural patrimony” that should not be alienated from the tribe. In the 1970s, the Denver Museum of Nature & Science bought the robe for $25,000 from art dealer Michael R. Johnson, who claimed it had been legally sold in the 1940s by the leader of the Naanyaay.ayí clan, Chief Shakes. However, Colwell shows how Johnson misrepresented the provenance of the object and presents clear evidence that it was the widow of Chief Shakes—a woman from an “opposite” clan as her husband, and therefore without the right to her husband’s clan’s at.óow—who sold the robe to an Alaskan curio dealer during the Great Depression. The Tlingit filed a claim for the Killer Whale Flotilla Robe, and the Denver Museum repatriated it in a 2008 ceremony. Curator Joyce Herold openly wept at the ceremony, but acknowledged that the lengthy negotiations and visits with Tlingit people resulted in a profound sharing of knowledge that helped her better interpret and care for other Tlingit objects in the Denver collection. Since these exchanges, Herold and other museum officials have personally delivered repatriated objects to tribal members, become guests at Alaskan koo.éex’ (or “potlatches”), and have been adopted into Tlingit clans. In part four, “Respect: Calusa Skulls,” Colwell turns to one of the most difficult problems for NAGPRA: culturally unidentifiable human remains. Many museums do not know from which tribe—or sometimes even from which region—human remains in their collections derive. In the 1990s, some archeologists maintained that returning unidentifiable remains for reburial equaled the “unwarranted destruction of our human heritage,” while many Native people held that there was no such thing as an “unaffiliated” Native American ancestor (221, 225). The issue was so thorny that Congress passed NAGPRA without specifying action for culturally unidentifiable human remains, placing that section of the bill “in reserve” and asking the newly formed NAGPRA Review Committee to determine its fate. It would take twenty years—until May 14, 2010—for the committee to issue language for Sec. 10.11, which holds that museums must consult with tribes on culturally unidentifiable remains (first with those tribes whose reservations or trust lands the remains came from; then with those tribes whose traditional territory encompassed the site of the remains; and, finally, with any federally recognized tribe who wants to claim them). If a tribe claims the remains, the museum must return them, whether or not affiliation can be proven. Whether to keep these remains in museums or return them to tribes that might be related is still controversial. It is also difficult to implement. As Colwell notes, by 2010—twenty years after the passage of NAGPRA—only about 27 percent of the Native American human remains in 650 museums in the United States were affiliated with a particular tribe (200). It is in this section that Colwell makes his best contribution to scholarship on repatriation. While the edited volume by Devon Mihesuah—The Repatriation Reader, published in 2000—and Grave Injustice: The American Indian Repatriation Movement and NAGPRA by Kathleen Fine-Dare, published in 2002, do a better job of contextualizing the repatriation movement within the larger campaign for tribal sovereignty of the American Indian Movement in the 1960s and 1970s, both books were published before the 2010 decision on unidentifiable human remains.1 In addition, unlike the excellent 2013 volume, Accomplishing NAGPRA, edited by Sangita Chari and Jaime Lavalee, Colwell’s book was written with the express intention of reaching a general audience.2 His first-person narrative of his experiences as a curator at the Denver Museum—combined with a wide-ranging history of repatriation across the United States—is one of the best introductions to NAGPRA available for a lay reader, and his insights into the repatriation process will interest scholars as well. Colwell keeps the language clear and the narrative exciting throughout this wide-ranging and thorough history of repatriation. He includes treatment of everyone from Maria Pearson, the Yankton Sioux woman known as the “Rosa Parks of NAGPRA” for her work in the 1970s to ensure that Iowa state law provided equal protection to Native American and non-Native American graves; to Kennewick Man, the nine-thousand-year-old skeleton found on the banks of the Columbia River in 1996 and locked in a museum until courts could decide whether such ancient remains were actually Native American. DNA tests later confirmed that Kennewick Man was Native American; he was given a burial by Oregon tribes in 2017. A few of his narrative decisions made me pause. Colwell frequently recreates historical dialogue drawn from interviews, notes, or recordings, but notes that he could not necessarily verify the wording. At times, I was suspicious of such inclusions. How did he know what a curator said in a Smithsonian museum vault decades before he entered the profession? How dare he recreate the words that Maria Pearson’s grandmother spoke from beyond the grave! Dialogue, however, is also part of what makes this book a compelling narrative, rather than a scholarly treatise on the history of repatriation in the United States. We need more scholars to do this kind of vivid and engaging writing and invite a general audience to participate in such inquiries. I am an archeologist. A scientist. I know how much the field has to teach us about the past. . . . But the value of my profession . . . does not trump all other human obligations. In a multicultural society, we have a duty to ensure that our own beliefs do not unjustly impinge on the freedom of others to pursue theirs. For me, it is a question of how we can try to respect cultural difference (238). Plundered Skulls and Stolen Spirits is notable for this kind of clear, respectful reflection on the issues of repatriation, and for inviting more Americans to understand the complex issues at stake over Native American heritage in museums. 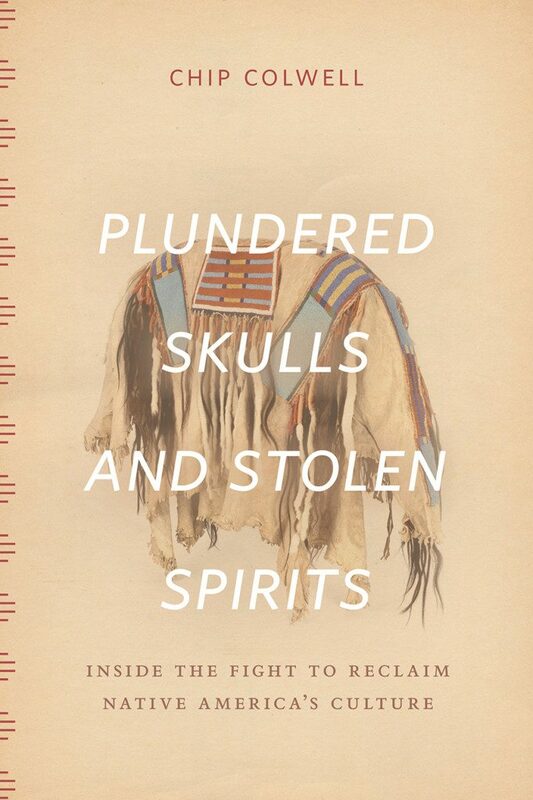 Cite this article: Emily Moore, review of Plundered Skulls and Stolen Spirits: Inside the Fight to Reclaim Native America’s Culture, by Chip Colwell, Panorama: Journal of the Association of Historians of American Art 4, no. 1 (Spring 2018), https://doi.org/10.24926/24716839.1643. About the Author(s): Emily Moore is Assistant Professor of Art History at Colorado State University.